Both of our boats have state of the art electronics, and are custom built to maximize your fishing experience. Over 50 years experience & coast guard certified. The Southern Dawn is a 31ft. Cape Horn Sportfishing Boat that is built for speed and some exciting deep sea fishing or trolling. The boat is an open design that allows Captain Ray to give a hands-on experience with you and your group of up to 6. The boat has shade and a restroom for your trip. This boat is built to get you on the fish quickly and can go anywhere that larger boats can go. 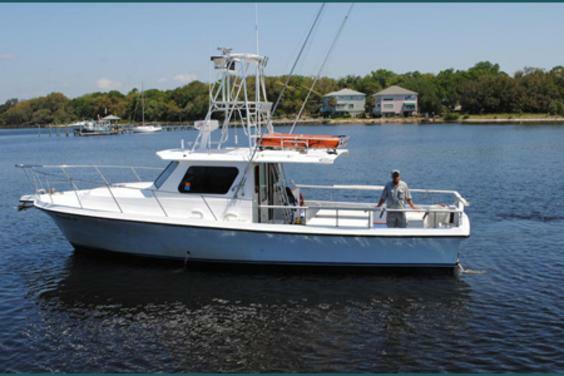 The Catch It is a 40' custom built boat that is built for doing some incredible off-shore and near-shore fishing. The boat is family friendly and is fast and comfortable while offering a full set of electronics, twin diesel engines, a clean restroom, a deck hand to help, and an air–conditioned cabin. The vessel can accommodate up to 10 people and is a 1st class family friendly experience. The Catch It can also accommodate split party trips if you have a smaller group.